King Tut’s famous gold funeral mask. Who exactly was King Tut, known during his early life as Tutankhuaten (or Tutankhaten), reflecting his Amarna roots, and later as Tutankhamun, reflecting the return to Egypt’s traditional religion? Despite the richness of his burial, King Tutankhamun remains somewhat of an enigmatic figure, even though he has been the subject of much investigation. Presumably, he was born in Akhetaten (modern el-Amarna), during the latter half of the reign of Akhenaten, the Heretic king who attempted to establish a radical departure from traditional Egyptian religion. 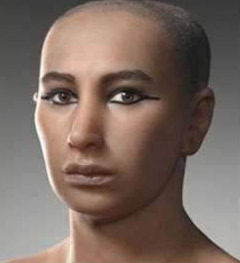 We believe that he died in his late teens, judging from various analyses of his mummy. Although his royal lineage has sometimes been questioned, an inscription unearthed at el-Ahsmunein across the river from el-Amarna confirms that Tutankhuaten (as he was known at that time) was indeed the son of a king. Not surprisingly, official policy during the boy’s reign seems to have been to stress his association with Amenhotep III, who we actually presume to be his grandfather. Given the absence of a long co-regency between Amenhotep III and Amenhotep IV (later Akhenaten), it probably must be that Tutankhamun was the son of the latter. 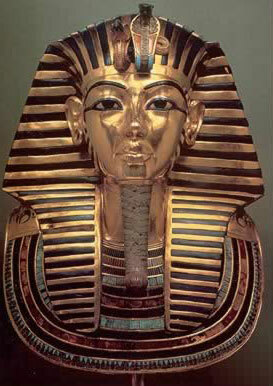 (King Tut) was not a major player in Egypt Pharaonic history, or at least, in comparison with other pharaohs. In fact, prior to Howard Carter’s discovery of his tomb, almost nothing was known of him and interestingly, the one disappointment in Carter’s discover was that there was little in the way of documentation found within his tomb. Therefore, we still know relatively little about Tutankhamun. For example, even who is father was remains a topic of some debate. That has not prevented writers from producing volumes of material on the Pharaoh. Tutankhamun ruled Egypt perhaps between 1334 and 1325 BC. He was probably the 12th ruler of Egypt’s 18th Dynasty. Tutankamun was not given this name at birth, but rather Tutankhaten (meaning “Living Image of the Aten), squarely placing him in the line of pharaohs following Akhenaten, the heretic pharaoh, who was most likely his father. His mother was probably Kiya, though this too is in question. He changed his name in year two of his rule to Tutankhamun (or heqa-iunu-shema, which means “Living Image of Amun, Ruler of Upper Egyptian Heliopolis”, which is actually a reference to Karnak) as re reverted to the old religion prior to Akhenaten’s upheaval. Even so, this did not prevent his name from being omitted from the classic kings lists of Abydos and Karnak. We may also find his named spelled Tutankhamen or Tutankhamon, among other variations. His throne name was Neb-Kheperu-re, which means “Lord of Manifestations is Re. 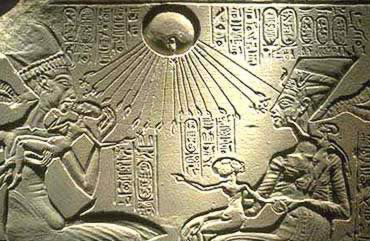 Though it seems that Akhenaten must have been King Tut’s father, much less evidence exists as to his mother. However, a degree of informed speculation is possible. For example, we can probably eliminate Nefertiti, since she appears to have provided her husband, Akhenaten, with no sons. Of course, she was not his only wife. Among the king’s secondary wives and concubines, one in particular stands out. She is lady Kiya, identified by some with the Mitannian princess Tadukhepa, daughter of Tushratta, sent to Egypt to cement treaty relations between the two countries at the start of the reign. 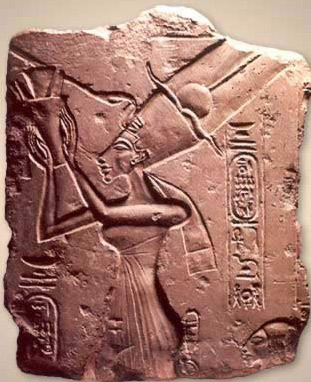 Kiya is peculiarly prominent in the sculptural record at el-Amarna and her special position in the king’s favor is reflected in her unique title, “Greatly Beloved Wife”. In a number of Amarna reliefs, Kiya is shown in the company of a daughter. Many believe that she might have also borne a son. Chronological considerations by no means rule out the possibility. There are indications that Kiya was a favorite of the Amarna court prior to years nine and ten of Akhenaten’s reign, but after year eleven, about the time of Tutankhamun’s birth, she disappears from the the record and her monuments at el-Amarna were appropriated by Nefertiti’s daughter, Meritaten. One possible explanation is that Kiya died in childbirth, as a fragmentary mourning scene in Akhenaten’s tomb perhaps suggests. However, it is equally possible that Kiya fell from grace, the victim of court intrigue engineered by the jealous Nefertiti. Indeed, it may be no coincidence that the meteoric rise in the status of Nefertiti seems to have begun in earnest only after Kiya’s disappearance. Irregardless of his mother’s identity, Tutankhamun came to the throne in about 1333 BC, then a young child still burdened with the name, Tutankhaten. 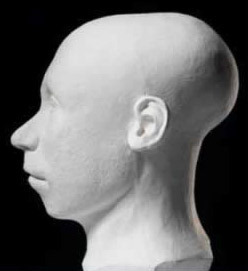 He married Ankhesenpaaten, the somewhat older third daughter of Akhenaten and Nefertiti, a match perhaps made to unite opposing royal factions. He would rule Egypt for only nine or so years, though there can be little doubt that for most of this time, the reigns of the government were firmly in the hands of others, such as Ay, his successor and perhaps a relative of the king, and General Horemheb, who would succeed Ay to the throne. Hard facts related to Tutankhamun’s reign are few, but it is clear that the principal event of his reign related to the reestablishment of the traditional Egyptian religion, as well as the relocation of the Capital back to Memphis and the reestablishment of the country’s religious center at Thebes. When the royal couple abandoned the “aten” forms of their name during year two of the king’s reign, it signaled the formal resurgence of Amun, away from the worship of Aten, and the traditional pantheon. Promulgated by a decree at Memphis and recorded in the retrospectively dated “Restoration Stela”, this one event marks the reign as pivotal to the subsequent course of Egyptian History. 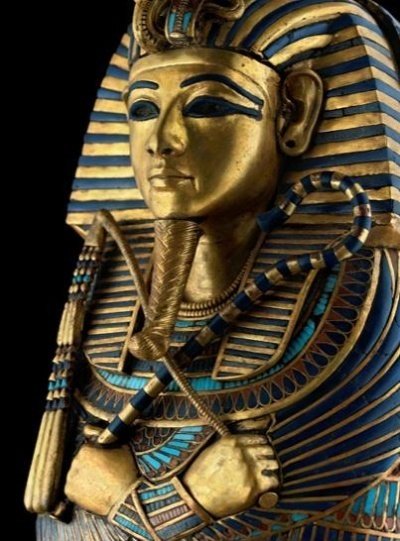 Hence, while it is frequently said that Tutankhamun was a relatively insignificant king (we too have been guilty of this), despite the wealth of his tomb, his reign was not. Whether the changes that were brought about were his, Ay’s or Horemheb’s, his was a very important time in the history of Egypt. Together, we know that Akhenaten and Nefertiti has six daughters, though it was probably with another royal wife called Kiya that the king sired his successors, Smenkhkare and Tutankhamun. Nefertiti also shared her husband with two other royal wives named Mekytaten and Ankhesenpaaten, as well as later with her probable daughter, Merytaten. Each of the royal women had her own sanctuary, which was frequently called a sunshade temple. They were usually situated in a parkland environment of vegetation and water pools, emphasizing the importance of female royalty in the daily renewal of creation affected by the god Aten. Nefertiti and her King lived during a highly unusual period in Egyptian history. 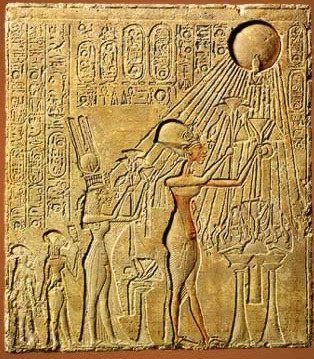 It was a time of religious controversy when the traditional gods of Egypt were more or less abandoned at least by the royal family in favor of a single god, the sun disk named Aten. However, it should be noted that the Egyptian religion did not actually become monotheistic, for cults related to the other gods did persist and they were never really erased from the Egyptian theology. those other great consorts who traced their descent from Ahmose-Nefertari. This links both sisters to the cult of Amun, which he tells us could obviously not have been openly proclaimed at Amarna. She in fact exhibits the same fashion as God’s Wife. From her first appearance at Karnak, she wears the same clinging robe tied with a red sash with the ends hanging in front. She also wears the short rounded hairstyle. In her case, this was exemplified by a Nubian wig, the coiffure of her earlier years, alternating with a queens tripartite wig, both secured by a diadem bearing a double uraei. Sometimes this was replaced by a a crown with double plumes and a disk, like Tiye and her later Kushite counterparts. 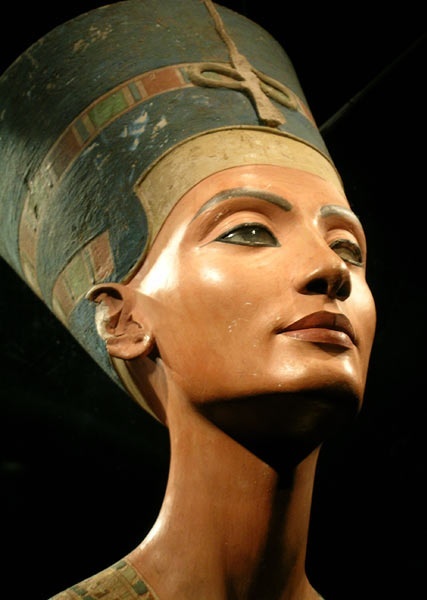 Towards the end of Akhenaten’s reign, Nefertiti disappeared from historical Egyptian records. For a number of years, scholars though that she had fallen from grace with the king, but this was actually a case of mistaken identity. It was Kiya’s name and images that were removed from monuments, and replaced by those of Meryetaten, one of Akhenaten’s daughters. It has been suggested, though there is no hard supporting evidence, that by year twelve of Akhenaten’s reign, and after bearing him a son and possibly a further daughter, Kiya became too much of a rival to Nefertiti and that it was she who caused Kiya’s disgrace. 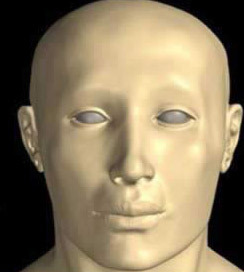 We do know that he spent his early years in Amarna, and probably in the North Palace. He evidently even started a tomb at Amarna. At age nine he was married to Ankhesenpaaten, his half sister, and later Ankhesenamun. 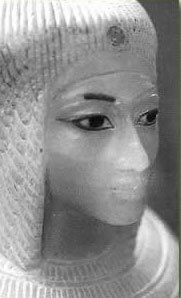 We believe Ankhesenpaaten was older then Tutankhamun because she was probably of child bearing age, seemingly already having had a child by her father, Akhenaten. 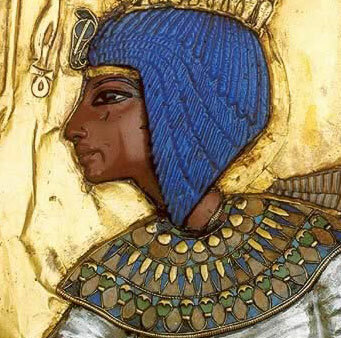 It is possible also that Ankhesenamun had been married to Tutankhamun’s predecessor. 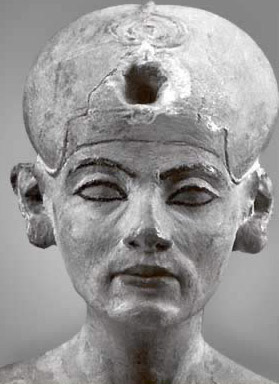 It seems he did not succeed Akhenaten directly as ruler of Egypt, but either an older brother or his uncle, Smenkhkare (keeping in mind that there is much controversy surrounding this king). We believe Tutankhamun probably had two daughters later, but no sons. At the end of Akhenaten’s reign, Ay and Horemheb, both senior members of that kings court, probably came to the realization that the heresy of their king could not continue. Upon the death of Akhenaten and Smenkhkare, they had the young king who was nine years old crowned in the old secular capital of Memphis. And since the young pharaoh had no living female relatives old enough, he was probably under the care of Ay or Horemheb or both, who would have actually been the factual ruler of Egypt. Kiya, a lesser wife of Akhenaten who was probably Tutankhamun’s mother. We know of a number of other officials during the reign of Tutankhamun, two of which include Nakhtmin, who was a military officer under Horemheb and a relative of Ay (perhaps his son) and Maya, who was Tutankhamun’s Treasurer and Overseer of the Place of Eternity (the royal necropolis). Others included Usermontju and Pentu, his to viziers of upper and lower Egypt, as well as Huy, the Viceroy of Nubia. Immediately after becoming king, and probably under the direction of Ay and Horemheb, a move was made to return to Egypt’s traditional ancient religion. By year two of his reign, he changed his, as well as Ankhesenpaaten’s name, removing the “aten” replacing it with “amun”. Again, he may have had nothing to do with this decision, though after two years perhaps Ay’s and Horemheb’s influence had effected the boy-king’s impressionable young mind. One reason why Tutankhamun was not listed on the classical king lists is probably because Horemheb, the last ruler of the 18th Dynasty, usurped most of the boy-king’s work, including a restoration stele that records the reinstallation of the old religion of Amun and the reopening and rebuilding of the temples. The ownership inscriptions of other reliefs and statues were likewise changed to that of Horemheb, though the image of the young king himself remains obvious. Even Tutankhamun’s extensive building carried out at the temples of Karnak and Luxor were claimed by Horemheb. Of course, we must also remember that little of the statues, reliefs and building projects were actually ordered by Tutankhamun himself, but rather his caretakers, Ay and Horemheb. His building work at Karnak and Luxor included the continuation of the entrance colonnades of the Amenhotep III temple at Luxor, including associated statues, and his embellishment of the Karnak temple with images of Amun, Amunet and Khonsu. There were also a whole range of statues and sphinxes depicting Tutankhamun himself, as well as a small temple in the king’s name. We also know, mostly from fragments, that he built at Memphis. At Kawa, in the far south, he built a temple. A pair of granite lions from that temple today flank the entrance to the Egyptian Sculpture Gallery at the British Museum. Militarily, little happened during the reign of Tutankhamun, a surprising fact considering that Horemheb was a well known general. Apparently there were campaigns in Nubia and Palestine/Syria, but this is only known from a brightly painted gesso box found in Tutankhamun’s tomb. It portrays scenes of the king hunting lions in the desert and gazelles, while in the fourth scene he is smiting Nubians and then Syrians. There are paintings in the tomb of Horemheb and as well as the tomb of Huy that seem to confirm these campaigns, though it is unlikely that the young Tutankhamun actually took part in the military actions directly. The campaigns in Palestine/Syria met with little success, but those in Nubia appear to have gone much better. After Tutankhamun’s death, Ankhesenamun was a young woman surrounded by powerful men, and it is altogether obvious that she had little interest or love for any of them. She wrote to the King of the Hittites, Suppiluliumas I, explaining her problems and asking for one of his sons as a husband. Suspicious of this good fortune, Suppiluliumas I first sent a messenger to make inquiries on the truth of the young queen’s story. After reporting her plight back to Suppilulumas I, he sent his son, Zannanza, accepting her offer. However, he got no further than the border before he was murdered, probably at the orders of Horemheb or Ay, who, both had both the opportunity and the motive. So instead, Ankhesenamun married Ay, probably under force, and shortly afterwards, disappeared from recorded history. It should be remembered that both Ay and Horemheb were military men, but Ay was much older then Horemheb, and was probably the brother of Tiy who was the wife of Amenhotep III. Amenhotep III was most likely Tutankhamun’s grandfather. 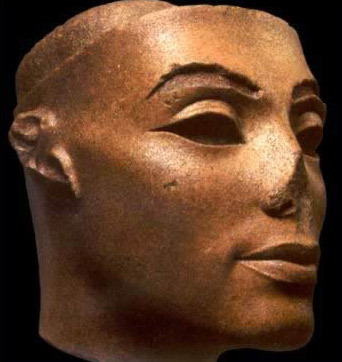 He was also probably the father of Nefertiti, the wife of Akhenaten. Therefore, he got to go first, as king, followed a short time later by Horemheb. Tutankhamun’s famous tomb is located in the Valley of the Kings on the West bank across from modern Luxor (ancient Thebes). It is certainly less magnificent then other pharaohs of Egypt, yet, because of it, Tutankhamun has remained in our memory for many years, and will probably continue to do so for many years to come. Regardless of all the myths surrounding his tomb’s discovery, including the “curse of the mummy” and other media hype, it is all a blessing to the boy-king. The ancient pharaohs believed that if their name was remembered, their soul would live on, so not even the powerful Rameses the Great’s soul can be as healthy as King Tut’s. It was all circumstantial evidence as such, but frequently that is all that investigators of ancient mysteries have to go on. And yet, the most recent findings on the death of King Tut (Tutankhamun) seem to conclusively indicate that he died of natural causes, rather than being murdered. Specifically, the latest report is that he died of gangrene caused by a broken leg.There was more than a little reason to believe that King Tut may have been murdered. The two principal suspects, Aye who succeeded him as king, and General Horemhab who in turn succeeded Aye to the throne, both appear to have been powerful men who, in effect, ruled Egypt while King Tut was a child. It would not be unreasonable at all to believe that, as King Tut grew into a young man, the two elder men would have resented losing much of their power. Furthermore, at the time of his death, King Tut was certainly old enough to have sired an heir to the throne himself, which would have at least technically eliminated Aye and Horemhab from ever ascending the throne. 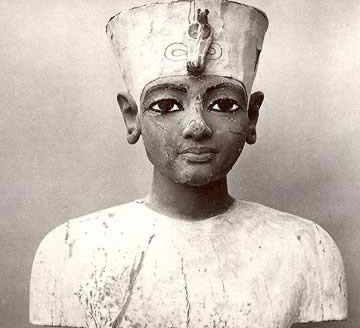 It is also noteworthy that the young King Tut was greatly loved in ancient Egypt for restoring the Amun priesthood after the death of his presumed heretic father, Akhenaten. However, this was almost certainly the work of Aye and General Horemhab, who could have even resented Tut receiving all the glory of their work. Finally, there was the issue of King Tut’s widow, Ankhespaton, who was apparently forced to marry Aye after King Tut’s death. Only a short time later, she disappeared from the annals of history, leading to speculation that she too might have been murdered. These circumstances all contribute to an ancient mystery, and much intrigue, a situation that was not completely uncommon in the Egyptian royal court. Attempts had, and would be made to murder pharaohs, a few of which were successful. Usually, these seem to have been plots within the harem with the goal of elevating one wife’s son to the throne over another’s. Now we are told, in absolute terms, that King Tut died by natural causes. However, lets take a little closer look. One of the most interesting aspects of Egyptology is that various scholars very frequently present their interpretation of events as absolute, and particularly in books or releases to the general public, neglect to reveal opposing views. This occurs all the time, frequently with one expert asserting absolutely one conclusion, while another asserting absolutely a completely different conclusion. For example, debates continue to rage over who was actually King Menes, the founder of the 1st ancient Egyptian Dynasty, with some scholars stating unequivocally that it was Aha, with others still believing it to have been Narmer. 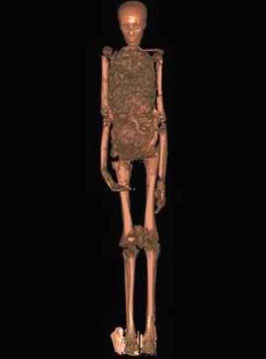 In the case of King Tut, one must first remember that his mummy is not in very good condition today. When Carter discovered it, his team basically dismantled the corpse while looking for amulets and other jewelry. Furthermore, many of its parts present at the original examination by Carter are now missing, and both skin and bones were broken in numerous places, supposedly also by the Carter team. Dr. Zahi Hawass, the Director of the Egyptian Supreme Council of Antiquities (SCA), makes some interesting comments about the most recent findings on King Tut. Though he seems to mostly be in agreement with these findings, he states, for example, that, “…some (not all) team members interpreted a fracture in the left thighbone as evidence for the possibility that Tutankhamun broke his leg badly just before he died”. “The team has noted a fracture of the left lower femur (thighbone), at the level of the epiphyseal plate. This fracture appears different from the many breaks caused by Carters team: it has ragged rather than sharp edges, and there are two layers of embalming material present inside. Part of the team believes that the embalming material indicates that this can only have occurred during life or during the embalming process, and cannot have been caused by Carters team. They note that this type of fracture, unlike most of the others, is possible in young men in their late teens, and argue that it is most likely that this happened during life. There is no obvious evidence for healing (although there may be some present, and masked by the embalming material). Since the associated skin wound would still have been open, this fracture would have had to occur a short time, days at the most, before death. Carters team had noted that the patella (kneecap) on this leg was loose (now it is completely separated, and has in fact, been wrapped with the left hand), possibly suggesting further damage to this area of the body. The part of the team that subscribes to this theory also notes a fracture of the right patella and right lower leg. Based on this evidence, they suggest the king may have suffered an accident in which he broke his leg badly, leaving an open wound. Although the break itself would not have been life-threatening, infection might have set in. However, this part of the team believes it also possible, although less likely, that this fracture was caused by the embalmers”. “Part of the team believes that the above scenario is absolutely not possible. They maintain that the fracture mentioned above can only have been done by Carters team during extraction of the body from the coffin. They argue that if such a fracture had been suffered in life, there would have been evidence for hemorrhage or hematoma present in the CT scan. They believe the embalming liquid was pushed into the fracture by Carters team”. “The entire team agrees that there is NO evidence for murder present in the skull of Tutankhamun. There is NO area on the back of the skull that indicates a partially healed blow. There are two bone fragments loose in the skull. These cannot possibly have been from an injury from before death, as they would have become stuck in the embalming material. The scientific team has matched these pieces to the fractured cervical vertebra and foramen magnum, and believes these were broken either during the embalming process or by Carters team”. So, while some recent news coverage seems to indicate that all of the questions surrounding Tutankhamun’s death have now been answered, at least for some scholars, they have not. Perhaps, once all the results of the recent CAT scan have been released, everyone may be in agreement, but there still seems to be some question, at least according to Dr. Hawass, that at least some of the team that examined the CAT scans disagree with the absolute finding that gangrene caused by a broken leg caused King Tut’s death. In fact, Dr. Hawass does reveal in recent media that we are not really completely sure how King Tut died, but that we know it was not murder. We have always had the utmost respect for Dr. Hawass, as we continue to have, but it was long suggested as a hypothesis that King Tut may have been poisoned, so in fact, if we are not certain as to how he died, then murder cannot yet be ruled out. Much is still unknown about the mummified king and the 18th dynasty of which he was part. 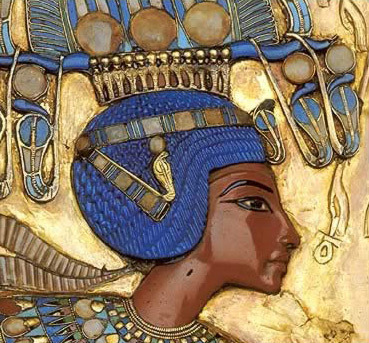 Tutankhamun’s death at the age of 19 is still shrouded in mystery. Ailments including malaria and scoliosis are believed to have plagued the king during his life, and a CT scan in 2005 showed evidence of a badly broken leg in the lead up to his death. KING Tutankhamun is credited with a curse that touched all those involved in the discovery of his tomb. New research suggests, though, that he was under a curse himself: one embedded in his genes. The boy king was the product of an incestuous relationship that may have led to a weakened constitution and his early death, the first DNA study of the pharaoh’s remains has concluded. Rather than being murdered, hurled from his chariot or struck down by an animal, as has been suggested, researchers have shown that the pharaoh was a sickly teenager with a club foot who probably died of complications related to malaria. The team of scientists from Egypt, Italy and Germany used the latest DNA testing techniques to draw “the most plausible” family tree yet for Tutankhamun, who died aged 19 in 1324BC, nine years into his reign. Over a two-year period, until October last year, they analysed samples from 16 mummies from the royal tombs of Luxor, and used computerised tomography (CT) scans to determine whether they were related, or had genetic disorders or infectious diseases. Using genetic fingerprinting and blood group tests, the study confirms that Tutankhamun was the son of Akhenaten, the “heretical” pharaoh who tried to reform Egyptian religion and culture during his rule from 1351 to 1344BC. It also identifies some of his grandparents and great-grandparents for the first time and suggests that his mother was Akhenaten’s sister. On the basis of other, less complete DNA evidence, Tutankhamun himself was the father of two children, both stillborn girls, whose remains were found in his tomb. Brother-sister marriages were common in the 18th dynasty of Egypt (circa 1550 to 1295BC) but scans and genetic fingerprinting show that he suffered from several disorders as a result of his family history. These included a painful, degenerative bone condition known as Koehler’s disease and a club foot which meant that the pharaoh was “a young but frail king who needed canes to walk”, the authors of the study say. The finding helps to explain the discovery of more than 130 walking sticks in Tutankhamun’s tomb when it was excavated by Howard Carter in 1922. The sudden death of Lord Canarvon, Carter’s benefactor, fuelled fears of a curse around the excavation. The exact cause of Tutankhamun’s death has baffled archeologists ever since, with some authors claiming that he was murdered by rivals or priests. “Many scholars have hypothesised that Tutankhamun’s death was attributable to an accident; septicaemia or a fat embolism secondary to a femur fracture; murder by a blow to the back of the head or poisoning,” the researchers write in the Journal of the American Medical Association. The genetic tests provide evidence that Tutankhamun and at least four other mummies from his family were infected with Plasmodium falciparum, a parasite that causes an often deadly form of malaria. The team, led by Zahi Hawass, of the Supreme Council of Antiquities in Cairo, concluded that the king’s many disorders probably weakened his immune system, so that he could have died after suffering a “sudden leg fracture, possibly introduced by a fall,” which became life-threatening when he got malaria. But Sanjeev Krishna, Professor of Molecular Parasitology and Medicine at St George’s, University of London, yesterday disputed the theory. “If you have the parasite and you get to the age of 19, the chances are you’ve developed some kind of immunity,” he said.